The Wicked Witch melted in water. She had good reason not to venture out in the rain. 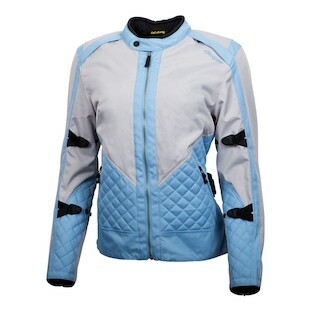 For those who are undeterred by a little precipitation, however, Scorpion has the riding jacket for you. As an unapologetic, no-nonsense, weatherproof option in the Fall 2014 Collection, the Scorpion Dominion Jacket is built for the female rider who will not give up her time on the road for anything. With a heavy-duty 600D poly construction and Sas-Tec protectors at the shoulders and elbows, this is a sturdy jacket built to be used. Underneath the rugged outer shell, a waterproof H2O-Blok liner will keep you dry, while a full-sleeve, removable EverHeat thermal liner can be employed to retain body heat on those cooler days. Additional features such as exterior hand warmer pockets and Nightviz reflectivity on the back augment the total utility of a truly encompassing jacket. So, fear not the inclement weather. Don’t allow it to keep you indoors. Get out, get going, and keep the Scorpion Women’s Dominion Jacket in mind when you do.